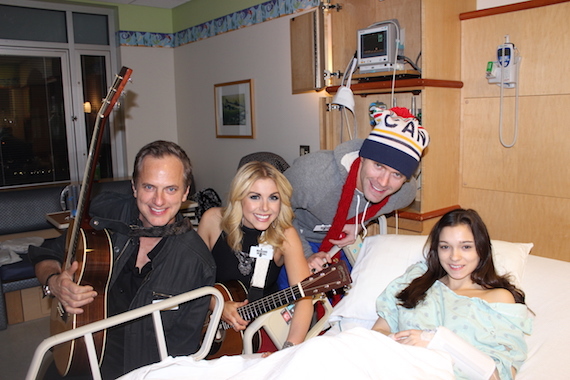 Pictured (L-R): Tom Poleman, Lindsay Ell and Bobby Bones visit with a patient as part of Musicians On Call. On-air personality Bobby Bones has been added to the Board of Directors for Musicians On Call, a nonprofit that brings live and recorded music to the bedsides of patients in healthcare facilities. Bones, who is host of iHeartMedia’s The Bobby Bones Show and Country Top 30 with Bobby Bones, reaches 4.8 million weekly listeners on more than 100 stations nationwide. As a Musicians On Call Volunteer Musician, Bones played at the bedsides of patients at the Nashville VA and Monroe Carell Jr. Children’s Hospital at Vanderbilt with the help of some of his friends like Lindsay Ell and Tom Poleman, President of iHeartMedia’s National Programming Group and Musicians On Call Board Member. Bones released his The Critics Give It 5 Stars comedy/country album with Black River Entertainment, with portions of the proceeds donated for charity. His live shows have raised over $2 million for charity. Bones’ most recent “Pimpin Joy” merchandise campaign raised $20,000 for Musicians On Call and he continues to raise funds for MOC through his current “Bobby For President” campaign.